SF-2001 interference discriminant PD detector is featured by high sensitivity and wide usage. 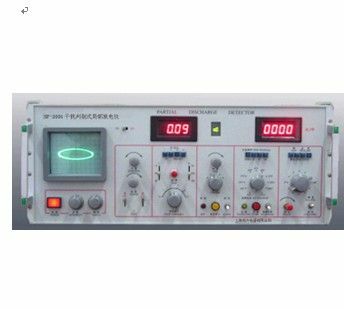 It is mainly used to test partial discharge for transformers, instrument transformers, cables, bushings, capacitors, generators and other high voltage apparatus. Unique interference discriminant electronic logical unit could discriminate irregular and intermittent interference. Strong anti-interference ability. Unique interference discriminant electronic logical unit could also eliminate measuring difference caused by different operators. Well-designed, easy to operate PC setting. Partial discharge value could be directly read. Sampling of pulse peak meter and reading of the digital voltmeter coordinate well in time sequence. Discharge time of a certain value (repetition rate n) could be tested. Cooperating with other units, it can measure q-n, n-ψ, q-ψ and other relations. (q-discharge, ψ-phase angle). With a digital meter display, different parameters could be viewed at the same time. Small size, light weight. The instrument is suitable for both power sectors and the manufacturing plants to do on-site tests, as well as for scientific experiments. Oval base scan: at 50, 100, 150 or 200Hz, 30° as a grade, 360° rotatable, Power intake <1VA. Amplifier：3db low end frequency f1, 10, 20,40kHz optional;3db high end frequency fh, 10, 20,40kHz optional; gain adjustable range >120db, scale gain difference 20±1db;positive and negative impulse response asymmetry <1db. Time window: window width 15о～150о, window rotatable 0~170°. Interference identification logic: the pulse peak exceeds the threshold (set by the user), and more than four consecutive test voltage cycles, the effective light show. Discharge repetition rate: range 1×104pps, error <5%F.S.